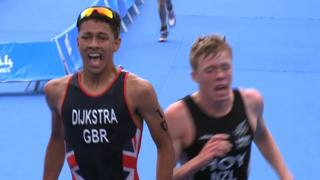 Triathlete Ben Dijkstra wins GB's first gold medal at the Youth Olympics in Nanjing, China, after beating Daniel Hoy of New Zealand in a photo finish. New Zealand claimed Dijkstra infringed in the transition between the cycle and run, however their appeal was later dismissed. The 15-year-old from Leicester is set to compete in the mixed-relay team event on Thursday alongside Sian Rainsley.